AD + Email Migrations | 100,000 accounts and three international companies! 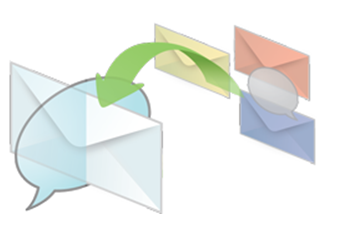 Merging different email and Active Directory domains can be a difficult task. It can be a time consuming process since many times it is necessary for on-site staff to physically visit each workstation. Whether your Email account and PC were migrated remotely during an evening, or one that required a special visit, our consultants will ensure that each system receives the same careful attention. Below is a brief synopsis and project history of a major, international email consolidation that our team of experts implemented. In this case 100,000 employee accounts disbursed across 60 countries, and as if that was not enough of a challenge, a third migration was added mid-stream. Fortunately our experienced IT staff have successfully managed transitional environments even when old email addresses are retained in parallel with new email addresses up until the completed, merged uniform email platform. In the below example, the process started migrating two Exchange platforms together, then Lotus Notes was add, and in all cases across an international landscape. Our IT consulting firm was engaged to drive and manage a consolidation of Microsoft Exchange and Active Directory for two international organizations totally over 100,000 employees. This was a requirement after the larger corporation headquartered in Paris, France bought a smaller U.S. based international company. The initial integration started with information sharing between the two organizations to prepare for the anticipated launch date. We pleasantly discovered similarities between the two organizations including AT&T as the primary network carrier for both organizations, Microsoft Active Directory 2003, Exchange 2003, and SharePoint 2003 were also common. Initially, this made for a much easier collaboration and integration. For the launch to be successful, certain critical systems including network connectivity, Email and Calendars needed to be in place quickly. We accomplished these tasks using traditional migration tools, but more important is the planning and management of such tools. Synchronization of separate AD and Email environments were closely monitored, and to ensure a successful project each migration tasks was managed with careful attention to detail and planning. In preparation for the announcement of the ABC Company acquisition of XYZ Company, the networks were connected, and the synchronization process started. On Day One both “ABC.com” and “XYZ.com” email domains began globally exchanging information. To add to the complexity, previous employees of XYZ.com were required to have two emails, an ABC company account for their new employer, but also the synchronization and continued used of their old XYZ company email account. Of the overall 38,000 emails accounts within XYZ Company, no email was lost and no critical business activity adversely impacted. This was step one of an even larger, more complex, global task yet to come. Next, was the migration and physical move of the XYZ Company email accounts. After performing certain pilot migrations, our teams continued with Email migrations of former XYZ.com employees. There were over 38,000 Users and Mailboxes to migrate across 32 sites worldwide. Migrations were completed in North America first, Europe quickly followed, then South America, and last Asia/Pacific accounts. In parallel to the above integration, ABC Company requested to add a third German company they had just purchased. The Germany (123) company was acquired and initially connected. While XYZ Company was also using Exchange, the third companies email system represented a significantly different approach and solution; since it was Lotus Notes new Exchange accounts were created for the 123 Company employees and the content migrated. The migration of the Active Directory services was completed for all of the German sites. As with many system migrations, at times, unexpected situations do enter into the equation. This occurred with the XYZ Company email migration in China. We encountered some difficulties with similar employee naming conventions. Careful planning was required to ensure the email migration did not erroneously merge similar named email accounts. Careful planning and good coordination of exchange migration was the order of the day, the overall project to migrate over 100,000 email and Active Directory accounts between two large organizations with the added twist of a third organization using Lotus Notes no less, being added. The outcome could have been an article describing a major email migration failure, but instead, I’m pleased to report, our IT consulting firm successfully managed various unknowns around the world, across multiple companies, and different platforms to produce a successful outcome. Experience and skill make the difference. Contact HDPlus today to find out how we can provide cost-effective solutions to all your exchange migration issues.